I can only tell you that I pulled 2 out of the packet of 5 - and tried them and using +v reference, they work perfectly with 22w compact fluorescent lights. Amazingly I wanted to test them with something more substantial - and I don't have a single higher power light in the house!!! I would go and buy a 100w lamp but they don't sell these in the UK any more!!! I'll see if I can find something more substantial. With a 22w light they run freezing cold. Maybe because it's a replica it works on 3.3V (The cheapest Omron G3MC-202P DC5 cost 3.5$ in quantity of 5000 pcs). Well, NEITHER are recommendations as my testing on the larger units is down to one lamp and I've not received the new little DIP unit yet - they are simply brought to your attention as something to consider. Hopefully over the weekend I'll get to do some more substantial testing. After some search I found this site. Peter, this may explain your results. The other issue I have come across in the past with SSR's is the current required across the output to turn them on. If the current draw of the switched device the output stage doesn't turn on reliably. Interesting chat - thank you. I am using an ESP8266-01's GPIO2 line to turn on a Fotek mains 40A SSR. Initially, the ESP wouldn't boot with the SSR connected, though it would work (see later) if I connected it afterwards. Pete - your tip of inverting the logic and pulling GPIO down to turn the SSR on fixed that one. Now it works from boot. However, "works" means "turns on the little red indicator lamp". Mains is not switched, and this is true of two SSRs. At least one of them is known-good, from use in another "non ESP) application. Any ideas would be welcome. Ok, so my first question - which little red indicator lamp? When I drive the SSRs I fasten them directly to 3v3 and the other end directly to the GPIO - and I must say I've avoided using GPIO2 as an output.... not for any other reason than I usually need an input with a pullup (Dallas etc) and so GPIO2 is handy for that. So - wiring - what exactly did you do? I'm using two Fotek 40A SSRs. They each have a red LED built into the module. When there is a signal in the 3 - 32v range on the input side with the right polatiry, the LED comes on. I did as you said - I wire the positive side of the SSR input to Vcc (3.3v) and the negative side to the GPIO pin, making it a low-active. That all works, in that the indicator LEDs come on and go off as they should (based on temerature in this application). But the LEDs status is not r3eflected in the SSR's output. There is no mains routed through the SSR regardless of LED status, and this is true for 2 different SSRs. Development. I was testing the "On-ness" of the SSR with an incandescent table lamp. It stayed off. But with a low energy CFL bulb in it, it comes on - allbeit flcikering quite a bit. The 'scope shows a rock solid digital input signal. There is 5mA going into the SSR input. The SSR spec mentions 12mA. I think this is all because the input voltage is marginal (3.3v is close to the lower end of the 3 - 32v range). I wonder if yours works just because of statistical variation between devices. Hmm. Tweaking up the supply voltage to the ESP to 3.38 fixes the problem entirely. So I guess the SSR is operating on the edge. 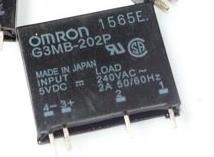 Ahh, and now the ESP is blown, I assume from the 3.38v overdrive. Oh well. I'm posting in case these are useful to others - as well as in the hope of insights from the experts.